The Mooni Full Moon Light 300 is designed for both indoor and outdoor use. 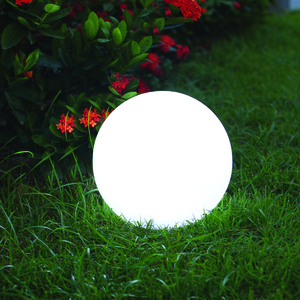 This simple and elegant design will fill your garden or home with the soothing light of the moon. • Indoor/outdoor Lantern: Stylish and portable color-changing lantern. Designed for indoor and outdoor use. • 16 LED colors + 5 light modes: 16 bright LED colors to choose from. 5 color modes - Solid, Flash, Strobe, Fade, Smooth. • Hours Of Light: Long battery life (Illumination 8-10 hours) Rechargeable with included DC adapter or any USB port. • Bluetooth Remote control: Streamline remote for changing colors modes. Like the glow from the night sky, the Full Moon sphere lantern displays diffused light in a soft white or an array of colors. Easily customize your lantern color output! Easily transition from an indoor space to an outdoor setting by simply taking your Mooni lantern with you. Convenient USB charging allows you to charge your lantern anywhere in the world.